How Apple is managed is one of its enduring mysteries. The idea that a company with $235 billion in sales is managed with a single P/L1 is fascinating in many ways. Not least of which is how it allocates resources. The fundamental question of which great idea gets to be funded and which great idea gets to be ignored is the core of every manager’s dilemma. The Apple problem is at scale when each decision’s consequences are so momentous. In the case of Apple there are so few projects that reach the market and their impact is so great that one wonders how they can be sure they are doing the right thing. Conventionally, product development is filtered through a sieve of metrics, market sizing and impact on top/bottom income lines. These “financial” measures of success are considered prudent and optimized for return on equity (also known as the maximization of shareholder returns). But this can be a toxic formula. The financial optimization algorithm always prioritizes the known over the unknown since the known can be measured and is assigned a quantum of value while the unknown is “discounted” with a steep hurdle rate, and assigned a near zero net present value. Thus the financial algorithm leads to promoting efficiency at the expense of creation. Efficiency may be the right priority when times are difficult and resources are scarce but creativity is the right priority in a time of plenty. And abundance is what being big is all about. To allow for some creation large firms create divisions. Some divisions are tasked with “core products” which are measured by a set of firm metrics and some are tasked with “emerging products” which are given a set of loose metrics. This leads to obvious resentment and war between divisions when resources need allocating. Ominously, the core divisions tend to always win. At the root of divisional power struggles are measurements–the roots of financial metrics. Managers fight with data. “You can’t manage what you can’t measure” they’re taught. But if you have something that can be easily measured and something that is difficult to measure, won’t the easily-measured be managed and the hard-to-measure be ignored? There is a general principle at work here: Managing by measurement is fraught with the pitfall of measuring the wrong thing. Making sure that you’re measuring the right thing becomes the value-adding role of the manager. A role that is increasingly being neglected. The unified P/L might be a clue. It obviates the need for divisional rivalry and power-based or financial politics. Without divisional P/L, management can be organized functionally with the obvious benefit of de-politicization. The singular P/L does create another problem however: the absence of an alternative resource allocation algorithm centralizes the decision. By centralizing decisions at the highest level, few decisions can be taken and that means each decision has to be right more often. We swap a distributed but financialized process for a central but capricious one. So how is the central decision process made fair? What guides the allocation process? I believe that Apple does not avoid quantified decision making. I believe the logic of their decisions is based on a nuanced quantification of the company’s customer base. Opting to think about how many customers they have rather than how many things they can sell could offer the Apple manager a better decision tool, avoiding financialization and mis-optimization. The guiding principle is putting the customer rather than the firm at the center of the decision process. The idea of this change of orientation extends to a re-definition of the purpose of the firm. Apple calls it its “North Star” and it places “making the best product” at that location. The challenge is how to measure “goodness” of product. It’s easy to overshoot “best” and become too good. What regulates greatness is another measurement: absorption of what you create. The true orientation (which Apple won’t confess to) is absorbable greatness. Absorbable greatness is measured through other proxies: customer creation, customer satisfaction, and customer retention. By adding and preserving great customers you can be sure that what you create is indeed the “best”. Setting the goal, and indeed the purpose of the firm, as the creation and preservation of customers seems to be the unwritten constitution of Apple. The idea that the purpose of the firm is to create and maintain customers is not new2 but it is relatively rarely practiced. The reason is that the data is harder to obtain. The data that comes from sales is crisp and concrete. The data about customers is muddy and soft. In a world where spreadsheets are used as weapons, the crisper the data, the better the ammunition. Clarity wins arguments but it may not be where salvation or truth can be found. Good judgement in a cloudy reality is a better compass than a clear road map to a fantasy world. 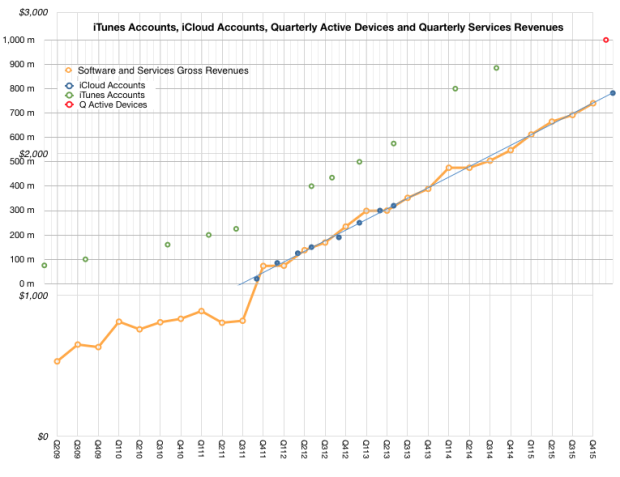 The following graph shows the historic data for service accounts and corresponding services revenues. The following graph shows the average price per hardware product indicative of loyalty through stability in the face of growing competition. 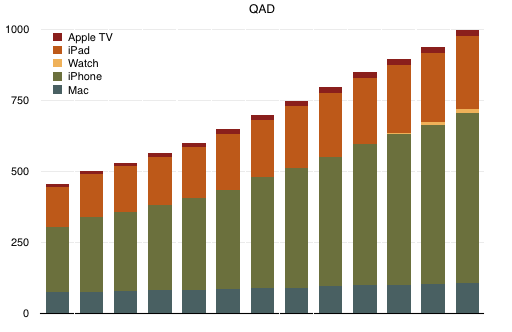 The following graph shows an estimate of growth in active devices as a proxy of customer base. Unlike product shipments and revenue data which follow rises and falls in individual products due to the cyclicality of technology and adoption, these graphs show a smoothness and predictability of customer base behavior. Looking at Apple this way gives the impression that the company has a large number (nearly a billion) of repeat (subscribed to service) customers. 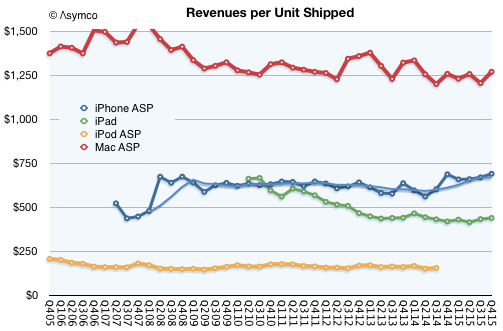 These customers can be seen to spend a predictable recurring amount (average selling price) on Apple’s brand. The repetition of these metrics in public commentary suggests that customer acquisition and retention are among Apple’s goals. The key question is whether this is Apple’s primary goal. For instance, offering education products, retail store experiences, healthcare products, green energy initiatives, accessories, content and services make sense even if they may have poor financial “returns”. These initiatives score highly on customer retention and satisfaction. They may lead to engagement and repeat sales. Managers working on these initiatives would gain the respect of their peers, leading to more esteem and higher quality output. Finally, and most importantly, these efforts would be preserved regardless of cyclical downturns. The assessment of analysts should therefore be couched in similar terms: “What is the impact of a new initiative in customer creation and preservation?” rather than “What is the impact of a new initiative in driving revenues and profitability”. We can see immediately why the second question is popular while the first isn’t: it’s easier to assess an answer to the second because we have the data that allows for its calculation. This is why asking the wrong questions is popular. It’s not cynicism. It’s access to data.